Several years after the retirement of the last of the “dragons,” corruption, crime, and venality have overtaken the supposedly good intentions of the weak politicians who, full of the promise of empty words with their thieving fingers hidden, took control of the capitol after the so-called “final campaign.” Now these politicians themselves have become mere puppets of the crime bosses, and fear rules both capitol and countryside. The ordinary, law-abiding citizens are only too aware of their need for a hero. A young man, whose mother claims he was fathered by the last dragon, has come of age without the teachings of his “father,” without even knowing his father, without even truly knowing if his mother was correct in naming his father. But this young man has faith. He “knows” in his heart that the dragon is his father, and he recognizes the need of his people for honor, justice, and peace. Seeing no alternative, the young man leaves for the countryside to seek the dragon and his assistance. Will the old man be able to return to his former powers and glory? Or will he train the youngster to take his place? The young would-be hero does not know. He only knows he must do something. Searching the depths of an ancient forest, last known dwelling place of the dragon, the young man disturbs the balance of nature, finally coming to the attention of a very old man. The old man exudes calm patience. He listens to the youngster. His mind comes slowly to grips with the facts of modern times. He realizes what his retirement without a replacement has cost the people, and he comes to the conclusion that he must engage with the enemies of peace and justice. Back in the capitol, the boss of all bosses struts, poses, and inflicts pain with impunity. The old man is not restored to his former power, if he ever will be, and the young man has yet to receive training. An encounter with the forces of darkness comes too soon, resulting in pain, damage, bewilderment. Both the ancient warrior and the youngster must battle despair and find the resolution to prepare to return to the battle. The old man, who is indeed the retired dragon, trains himself and his new apprentice. 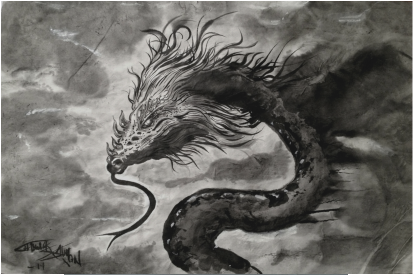 The dragon, it soon becomes apparent, will never reclaim his prior glory, but gradually the apprentice reveals his talent and acquires the dragon’s ancient skills. Perhaps he is truly the heir of the ancient warrior. As all too often occurs, the mentor falls, ambushed by insidious trickery. Facing the forces of evil without his mentor, the young apprentice falters at first, but discovers his inner strength in the midst of battle. The new skills and raw talent, burnished in the crucible of battle, lead to triumph and the emergence of a new dragon, the mighty warrior who can restore peace and honor. The new dragon journeys back to the capitol. Caution accompanies victory as much struggle remains.